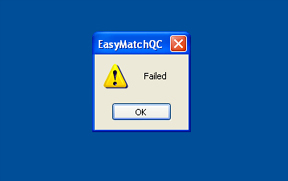 EasyMatch QC error message - "Failed to create empty document"
These error messages are most likely a result of the user not having the proper privileges on the computer. After installation of EasyMatch QC software versions > 4.20, the following privilege levels should be set automatically if the person performing the installation has System Administrator privileges for the network or local PC. All Users must have read/write/modify privileges to “c:\HunterLab\EasyMatch QC” and all sub-folders. This is where all User-created or modified files are kept. Read/write/modify privileges are needed for all Users to read and save measurement data. This folder should be archived for safety of User data. In EasyMatch QC 4.60 and higher, this can be configured at Options\System Configuration\Data Storage and check EasyMatch QC Users File Backup.